Please Join Us For Our Second Annual Fundraiser! The Laurie McBride Scholarship now live! A transgender Rocklin Academy Charter School elementary student was harassed at school and the target of discriminatory policies proposed by parents and conservative groups in the area. This activity came as a result of the child transitioning over the course of a year and bringing the storybooks "I am Jazz" to school for the teacher to read at story time. The teacher read the stories and felt very proud of how well the children handled the discussion. There were false storylines portrayed online, but the school provided a fairly dispassionate statement of the facts. 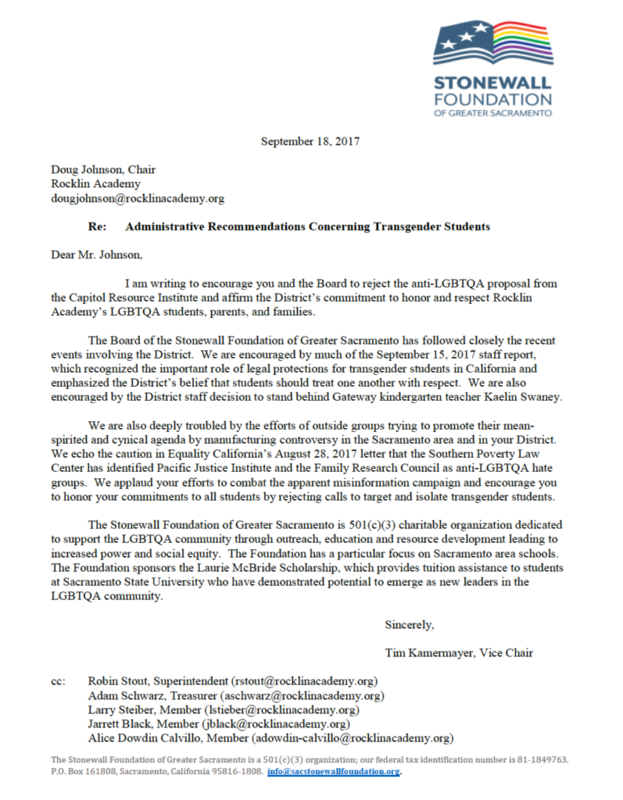 School officials have been very supportive of the teacher and protective of the privacy of the student and her parents in accordance with the law, but they were under attack by parents and conservative organizations, including the Capitol Resource Institute, Pacific Justice Institute, and the California Family Council. These groups were sending inflammatory emails propagating a false narrative of what happened at the school, generating a media frenzy, and pledged to turnout thousands of people for the Rocklin Academy school board meeting held in September. 3) require notification and segregate transgender children where a “physical privacy concern” may exist, allowing parents to opt-out their children. Most importantly, the child, her family, and the school were supported at this meeting by many in our community who opposed these discriminatory proposals that sought to target transgender children. The proposed policies also violated the Fair Education Act and principles of inclusionary education and……DID NOT PREVAIL! A win for children, families and our community in general. 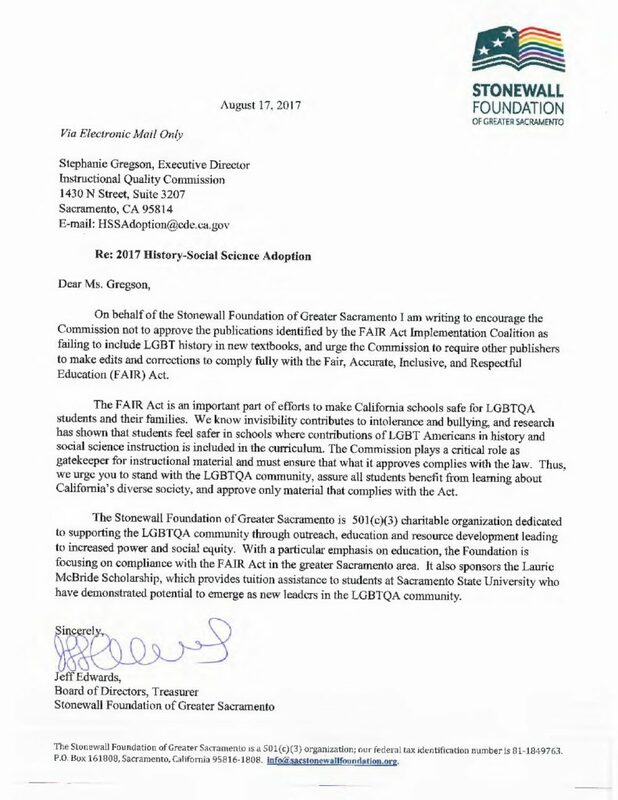 Submitted to the California Department of Education’s Instructional Quality Commission in support of full implementation of the Fair, Accurate, Inclusive, and Respectful Education Act. 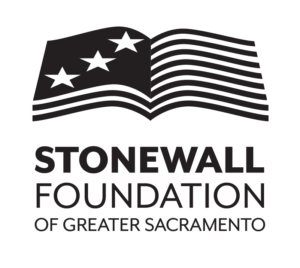 The FAIR Act seeks to build knowledge and appreciation of our pluralistic society by including LGBTQ age-appropriate histories in K-8 public school social studies textbooks.